SAN FRANCISCO (AP) — Apple is making more money than ever, but it still doesn't seem to be enough to keep everyone happy. Not with conspiracy theories swirling around Apple's secret slowdown of older iPhones while a cloud of uncertainty looms over its high-priced iPhone X. It's a reality check for a company accustomed to an unflinchingly loyal customer base. Apple expected buyers to embrace the iPhone X as a revolutionary device worth its $1,000 price, but it appears many Apple fans aren't impressed enough to ante up, especially with other recently released models selling for $200 to $300 less. And not even the less expensive iPhone 8 line appears to be selling quite as well as analysts had expected, based on the numbers that came out Thursday in Apple's fiscal first-quarter earnings report. What's more, consumers disillusioned with the slowdown of their devices may be even less inclined to upgrade. Apple said the slowdown was its effort to prevent unexpected crashes on phones with old batteries, and it's now offering to replace those batteries for just $29. That $50 discount is available as part of Apple's apology for not being more forthcoming about what it did. 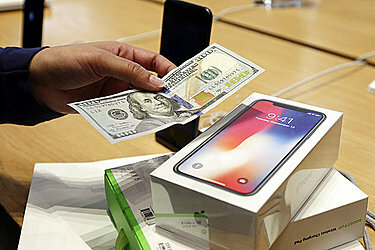 "Once you get past all the enthusiasts who want the iPhone X, you get down to a lot of people who think $1,000 is a lot of money for a phone," said analyst Bob O'Donnell of the research firm Technalysis. "We may be getting near the peak of the smartphone market, and that impacts everyone, including Apple." Apple CEO Tim Cook said the iPhone X has been selling even better than management anticipated, describing it as its top-selling model in every week since its release in early November. But Apple's revenue forecast for the current quarter fell below analysts' already diminished expectations, fueling fears that the early appetite for the iPhone X has quickly faded. Those concerns are the primary reason Apple's stock has fallen about 7 percent since hitting an all-time high two weeks ago. The shares ticked up $1.02 to $168.80 in extended trading after the quarterly report came out.